Culligan Home Drinking Water Service is the easiest way to better drinking water in your home. 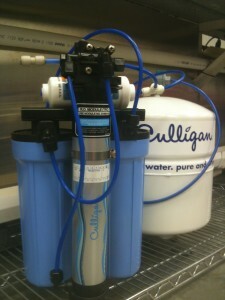 You get an almost unlimited supply of fresher, cleaner, pure tasting Culligan water. You get an almost unlimited supply of reverse-osmosis water (the kind of water featured in spot free car washes). Use it for drinking, beverages, washing fruits and vegetables, cooking, humidifiers, water for pets and watering house plants. You can connect direct to your fridge dispenser for better tasting ice and drinking water (and it extends the life of your ice maker by years). Culligan Drinking Water Systems are multi-filtration units that feature reverse osmosis and can remove up to 99% of contaminants that might be in your water. Culligan’s patented water filtration technology is designed to reduce impurities in your water like chlorine, lead, radium, and cysts, leaving you with nothing but clean, healthy Culligan water. Click for a list of common contaminants that can be taken out of your water. The system we use, The CWT Culligan West Texas unit, was specifically engineered for the tough water condition found in the Texas panhandle. Not available for purchase. Culligan Home Drinking Water service is an integrated service package. We take care of the system from installation to ongoing service… We schedule a TSR Total System Replacement every 18 months (it’s like getting a new system every time!) and we are available to test and care for any service issues that you might encounter. The reason we don’t sell units is our research indicated that over 95% of homeowners don’t replace their filters in a timely fashion and end up drinking un-treated water … with Culligan service we change the entire system long before the filters stop doing there job. We think the quality of the water you put in your body matters.